Combines my K and G Articulation pages. Each has 16 pages of articulation fun. 6 scene pages each (3 color and 3 black and white). 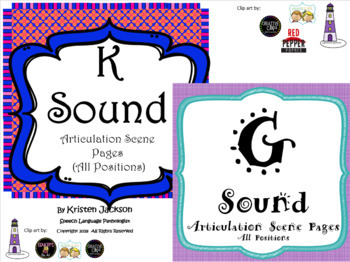 Language ideas are included on multiple pages for using with mixed groups. Additional pages include articulation dice (all positions) and a K and a G twister that has all three sounds on one page. Use it to get 100 trials (say each word two times) or play it as a game. Both a Castle and a Mine shaft Card Sorter are included to use with the pictures - just cut them apart, put them in the correct doors, and they come out sorted. The articulation scenes are also good for following directions and telling a story.